Located on Amelia Island, north of Jacksonville, American Beach was founded in the early 1930s by Abraham Lincoln Lewis, president of the Afro American Insurance Company, for his African-American workers. 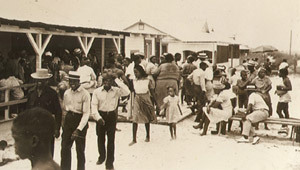 As one of the few Florida beaches open to African-Americans during segregation, the community continued to attract throngs of visitors through the 1950s. More recently, development encroached on the town, and Lewis' great-granddaughter, MaVynee Betsch--a brilliant eccentric known locally as the "Beach Lady"--helped marshal supporters and partners to help preserve it. In 2004, TPL purchased the historic Evans' Rendezvous nightclub and held it until Nassau County could acquire funds to protect it as a cultural center and historic park. Betsch, who died in 2005, will be remembered by a plaque in the building.